We know the first symptoms of a cold quite well; a sore throat, a runny or blocked nose, sneezing, headache, mild fever and muscle aches… but when it comes to little kids, we kind of have to look out for the signs and often don’t realise much is going on until they start acting unlike themselves. Mums know it before anyone else – something is just not quite right! 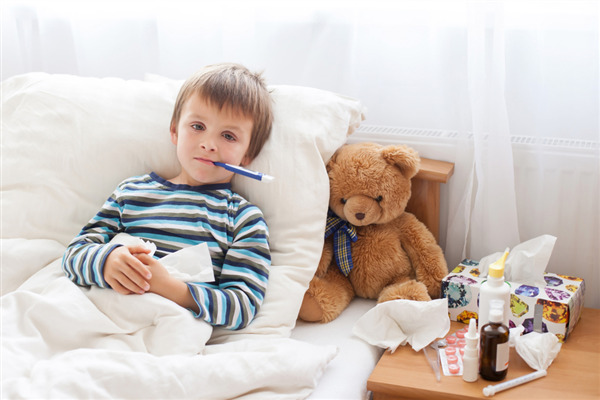 The common cold is most contagious in the first few days, so at the first sign of a cold you should act quickly and keep your child home from day care or school. - Use saline drops or a spray to relieve a congested nose. - Run a humidifier to put moisture back in the air (this is particularly needed in winter when heaters are run often). - Give some pain relief medication (paracetamol or ibuprofen) if throat is sore or headache is severe. - Make a warm honey drink to soothe a cough. - Also give a butter menthol or soother lollies to help with a sore throat (if old enough not to swallow or choke). - Run a hot shower to create steam in the bathroom and sit in there until some mucus has cleared. This is great in the mornings if you find that is when your child is most stuffy. - Lots of fluids such as water, milk and soup are great. Double the usual amount your child normally has per day. - Blankets, pillows and a hot water bottle on the couch with their favourite movie should help a great deal. If your child seems to be getting worse, or experiences an ear ache, chest pain, is coughing up mucus, has difficulty breathing or is unable to keep liquids or food down you should call your doctor immediately.